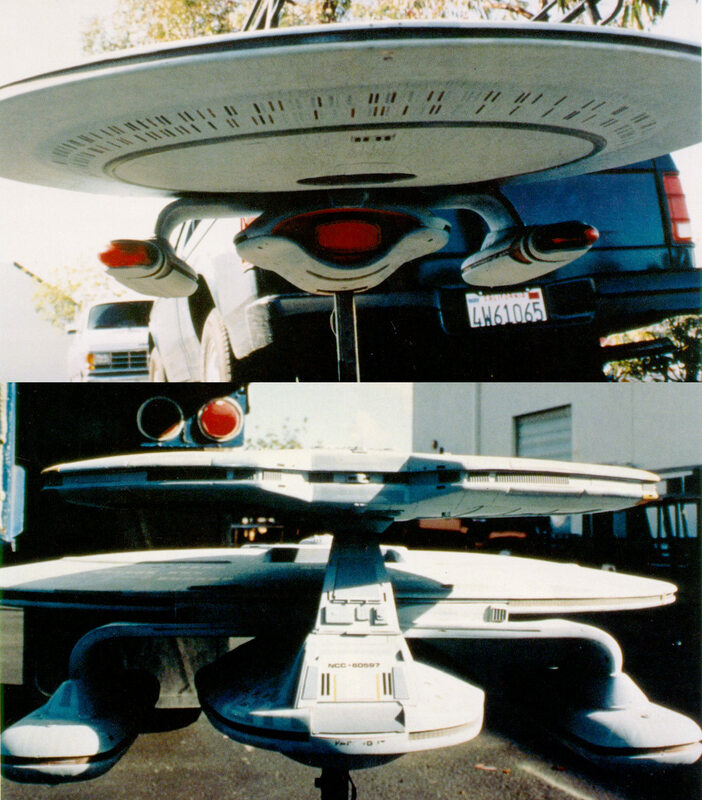 - The Nebula model was refurbed for its single dorsal shot in "Generations". It was labeled only on the dorsal half plus pylons. - In the intervening time, the model was re-detailed on the ventral side (only?) for its appearance as Leeds in the DS9 opener. It could still say Farragut on top, thus sourcing this confusion. - Subsequently, the model is used in "First Contact" but without any re-labeling, as they knew it would be only in the background. For all we know, it STILL says Farragut on top and Leeds on the bottom, as the model was replaced by the various CG models after this. The Vegas folks only paid attention to the LARGE name on the top and not the tiny one on the bottom when mounting the model, and so labelled it according to its first appearance as Phoenix and what they read. Next - someone track the lineage of the Miranda model. Well, no. It was labeled everywhere except the ventral saucer. That's what I *was* saying, but I found evidence to the contrary. So I'm not saying it anymore. It's not impossible, but the pics I found showing the Leeds' registry on the pylons and pod make it seem unlikely. Especially since Okuda never mentioned anything about it when he gave us the Leeds' information. Well, seeing if the model was labeled as both Farragut and Leeds, and the Farragut was destroyed by the time of FC, then I'm perfectly happy to accept it was the Leeds at the battle. I'm sticking with my original supposition. The handlers of the model saw only "FARRAGUT" pasted across the upper hull, and stuck with that. The folks who actually DID the detailing may not have been informed of exactly what the VFX shot would be except in the broad strokes, i.e. upper half, lower half, etc. So, knowing that Farragut would've been seen from above, they didn't bother labeling the bottom of the saucer (but they did do the pylons). Likewise, when the detail guy got the memo that they'd need the Nebula model shot from below for the new DS9 opener, they re-did the bottom, pylons, and other smaller details without knowing how far away the ship would be in the shot, etc. The ship could thus still say "FARRAGUT" across the top. ATTENTION ALL POSTERS! I NOW ANNOUNCE THAT I AM FLIP-FLOPPING ON THIS ISSUE ONCE AGAIN! Check this out, yo. The evidence is not so contrary to my initial thoughts as I initially thought! Well I'll be damned. The pod at least is still labelled as Farragut. But how do we know that shot wasn't taken partway through the changeover? No, seriously, uh, by the date on the photo? 1998 post-dates the 1995 airdate of "Way of the Warrior" (first appearance of Nebula in credits) by, like, a lot. Just because it's date-stamped 1998 doesn't mean it was actually taken in 1998. The photo had probably never been used prior to its inclusion inwhatever article you got this from. Which, I'm guessing, probably came out in 1998? ...and, in case you don't remember what I'm talking about after nearly three years, reread the first post! 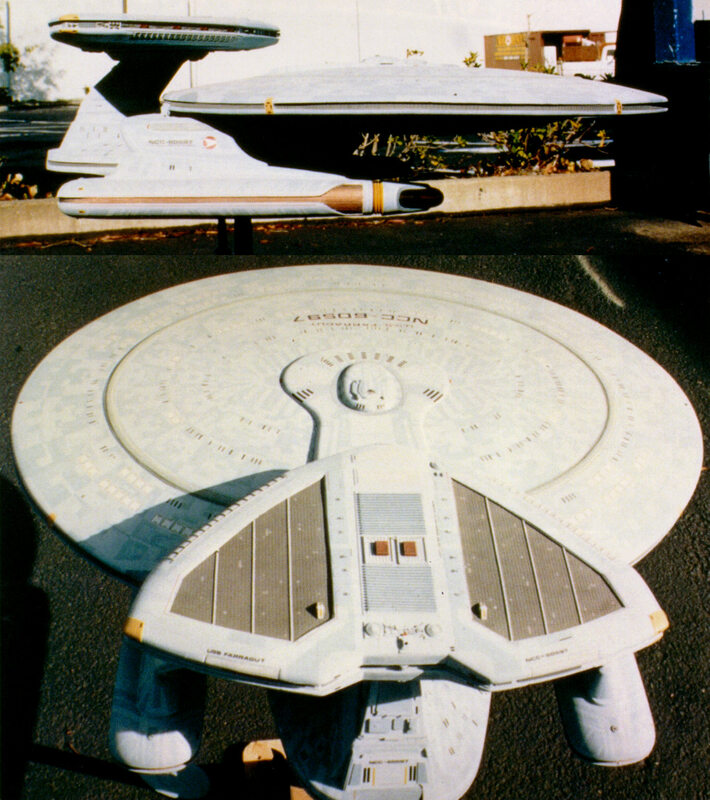 ...or, I can simply recap: The Nebula studio model that was labelled as the U.S.S. Farragut NCC-60597 for GEN was relablled for the DS9 opening credits as the U.S.S. Leeds NCC-70532, but only on the ventral saucer, pylons, and aft shuttlebay. 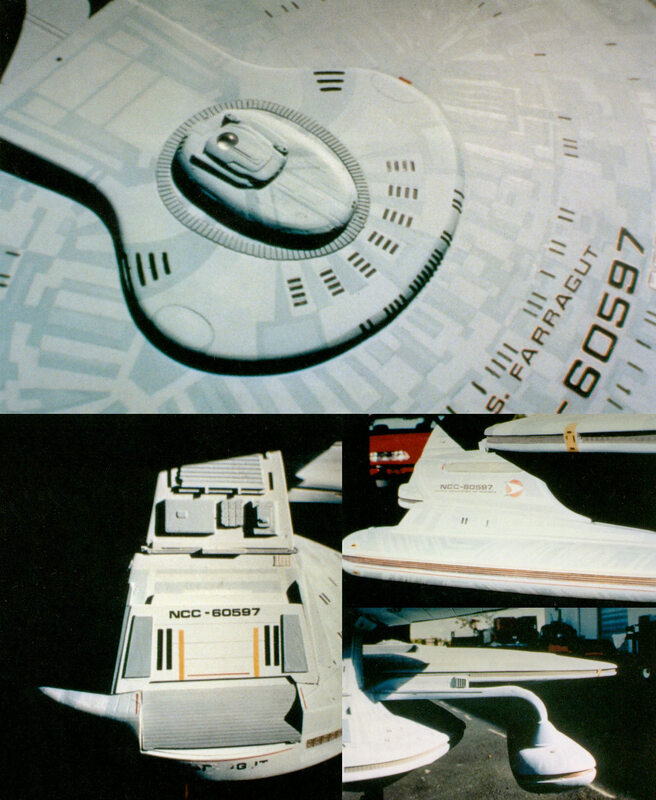 The dorsal saucer and upper sensor pod remained labelled as the Farragut. Well, mmmm, ahhh, uhhh, congrats man. Looks to be about 2 Years, 7 Months, 3 Weeks, 3 Days, 5 Hours, 5 Minutes between Lee's post and yours. Thank you, Data. And Spock. Just out of curiosity, what's the current record on a zombie thread? I'd say this is pretty close.